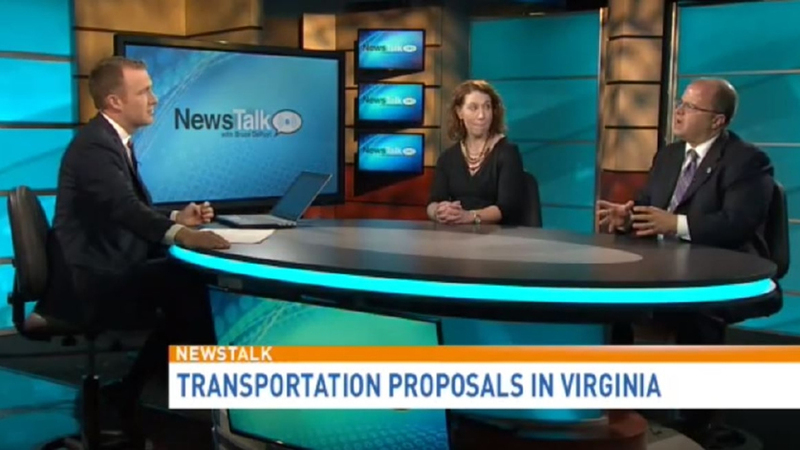 Today on “Newstalk,” we look at transportation proposals in Northern Virginia. The state has big plans for the roads from widening highways to replacing and repairing bridges. But where’s the money coming from? We’ll talk with Marty Nohe and Nancy Hiteshue and then we’ll get an overview of DC mayor Muriel Bowser’s trip to China. Was it successful, was it worth it? We’ll discuss it with Jim Dinegar from the greater Washington Board of Trade. From newschannel8, this is “Newstalk” with Bruce Depuy >>> Hello and thanks for joining us. I’m Mike Carter-Conneen in for Bruce. Because of the transportation package, former governor Bob Mcdonnell got through the general assembly, there’s finally some money to spend. Now the question is which projects should get the green light. Here to discuss the proposals, Marty. The chairman of the Northern Virginia Transportation Authority and a member of the Prince William Board of County Supervisors. We’ll also joined by Nancy from the Northern Virginia Transportation Alliance. Welcome to you both. >>> Good Morning. >> Mike: We also want to mention we welcome your questions and comments. Which project do you think should be a top priority in Northern Virginia for transportation leaders? Let’s start with the headline this week. Virginia’s transportation secretary saying that he wants to extend express full lanes in Northern Virginia to the DC line converting HOV lanes into high occupancy toll lanes. Accepting EZ pass and having variable pricing. The secretary says this project could also expand the current two lane road way into three lanes. Nancy, let’s start with you. Good move or bad move? >>> I think good move. The proposal is not new. It was originally proposed as part of the whole 95 corridor express lanes package. As you might recall, the plans were put in halt over some lawsuits on the 395 segment. We’re pleased to see Virginia moving forward on this piece and the local jurisdictions moving forward in tandem with them. I think it will be a great option for travelers through that corridor. The additional third lane, as we’ve seen on 95 and on the 495 express lanes, not only provides reliable travel times for those users on the express lanes, but it’s also improved travel time in the general purpose lanes. I think it’s a win-win for the whole corridor. Mike: Nancy mentioned the lawsuits. That this similar plan was halted years ago after Arlington County filed a lawsuit. Their concerns were over pollution? >>> I don’t want to speak for them, but they did have issues with air quality. There’s a lot of opportunities to both get more cars off the road through transit, but also improve air quality by having fewer vehicles on the road. Mike: What’s the timeline for this project? >>> It’s gonna take some time. There’s no question about it. I’ve heard three years? >>> I think I heard the governor this morning about an hour ago say that they expected construction to begin in 2017 and the project to open for usage in 2019. Mike: Are there possible unintended consequences that would come from this? For example, I was reading concern about what happens if the DC line, the 14th street bridge, already some what of a bottleneck depending on the time of day, if you go from three lanes to two lanes, is that gonna make the situation there worse? >>> Great question. One of the biggest challenges we’ve got in the 395 corridor is access to the Pentagon. No question, there’s a lot of people going into the city. And there’s traffic congestion when you hit the 14th street bridge now. Hopefully if we can take some cars off the road as they approach the Pentagon, they’ll be less congested in the entire corridor and more opportunity, therefore, to find better ways to configure interchanges and intersections. Mike: Let’s talk big picture while we have you both in here today. There was a survey released of local driver’s views on transportation. No big surprise, the number one issue that drivers are concerned about is reducing trip times. Followed by making transportation services more affordable. The question is how. What is the top proposal or the low hanging fruit, if you will, on addressing that? >>> Well, for the last two years, the Northern Virginia Transportation Authority has finally had revenues that we’ve been asking for for a generation. Millions of dollars of money that can be invested in transportation exclusively in Northern Virginia. That’s a really big deal. Absolute game changer. It becomes really incumbent enough on the authority to invest those funds into those regional projects that can relieve the most congestion. The good news for us is there are a lot of projects to choose from. We’ll never find ourself in a situation saying, is there anything to spend this money o on? There are so many projects. The law really expects us to focus on those projects that relieve the most congestion relative to costs. Where can we get the biggest bang for the buck. So far, top priorities for us have been the route 28 corridor which is a road that runs from western Prince William County through Manassas Park. Eastern Prince William County into Fairfax and Loudoun. A lot of jurisdictions at play there and there’s a lot of demand for improvements of that road. We’re making some very serious investments because we know we can get more asphalt on the ground and get more lanes opened up very, very quickly. Mike: Does that mean just widening the road way? >>> Not just widening, great question. Certainly add more lanes, but also add more pedestrian and bicycle connectivity. On sections of Route 28, that road is not just a commuter corridor, it’s also home town main street. It’s where people go shopping and take their kids to school. We will never be able to put enough lane miles to handle all of the traffic congestion in Northern Virginia. We have to open up commuter options on all of our major corridors. Looking at Interstates, secondary roads, commuter options for transit, bicycle, pedestrian, putting all those pieces together to have a more comprehensive transportation system. That’s what our plan update has been all about. >>> I think 28 and route one are great improvements. But it’s important that we look at the bigger road structures that impact all those other roads. Marty talked about 95 impacting route one. Route one is where people dump off on to when there are problems on 95. By being able to look at and address and fix our congestion problems on 95 and 66, we can then really assess what needs to be done more on route one and route 50 and 29 in the future. Putting the cars that want to be on 95 and 66 back on those roads and off the side streets and then being able to really address what’s going on on the side streets. Mike: You raised 66, what is the solution? >>> I think for outside the beltway, you really have two different 66’s. There’s inside the beltway and outside the beltway. The proposal would ad an additional lane from the beltway out to route 15. It provides funding for enhanced transit service in the corridor. It’s a bold solution that can help us in the future. It’s sort of like on the beltway when we made the widening of the beltway a few years ago. That really was the final fix for the beltway. What we do now for 66 is probably gonna be the last major improvement that we do and it needs to be something bold. I think what they’re proposing outside the beltway is a good solution. Inside the beltway, there’s a whole other conversation. It’s a very different project. We do have concerns. The alliance has been a strong proponent of widening inside the beltway for many years. anyone who sits in the traffic or sits on the orange line trains that go through that corridor can see that the need is obvious.